This giveaway is now CLOSED. Thanks so much to our wonderful sponsor The California Wine Club! We look forward to working with you again. The Winner is *'Gina Nuzio'*. Remember: There are great giveaways active on the upper right hand side of the page! I'm happy to say we are resuming our annual holidays buying guide this week with an ADULT themed giveaway! Don't get me wrong, I love providing you guys with Kids Corner, but I'm not yet a mom, and my City Girl lifestyle is a lot more cocktails and wine than it is soccer matches or car pools! I know different schools have different rules and different gift etiquette, but I'm sure most teachers will tell you they'd prefer the grape to the apple, and by grape I do mean wine. Ƹ̵̡Ӝ̵̨̄Ʒ - Each wine club shipment includes two bottles of award-winning wine - Every month they feature two different wines from a winery located in not just Napa and Sonoma, but also places like Monterey, Santa Cruz, Santa Barbara (when I grow up, whenever that is, I want to live there!) and even the Sierra Foothills. Your CWC wine of the month club adventure will take you to wine regions not normally represented outside of California's wine community. Ƹ̵̡Ӝ̵̨̄Ʒ - Detailed and beautiful 12-page, full color publication, Uncorked - offers an up-close and personal look at the family behind the wines plus tasting notes, recipes, wine luminary interviews, games and so much more. Ƹ̵̡Ӝ̵̨̄Ʒ - Just $49.45* per month includes shipping and handling. *Plus sales tax where applicable. Ƹ̵̡Ӝ̵̨̄Ʒ - Bruce and Pam work with the wineries directly. No middleman and no distributor mean members get the best choice of wine, at the best possible price. Members can even reorder their favorites and save up to 50% off normal retail. Ƹ̵̡Ӝ̵̨̄Ʒ - There are no wine of the month club membership fees, you can cancel anytime and every wine is 100% guaranteed. Ƹ̵̡Ӝ̵̨̄Ʒ - There is never any bulk, closeout or private label wine. I have had the pleasure of receiving 3 months of selections from The California Wine Club's Premier Club, I also tried out a shipment earlier in the year that I also loved and definitely plan to re-order from Bixler Vineyards. I'm in love with the 2008 Union Island White! I tried Perry Creek Zinman's 2008 Zinfandel, El Dorado - What makes it even sweeter is that it's sustainably farmed and produced from Old Vines. A unique legend: The legend of ZINMAN can be traced back to the days of the gold rush. It was then that reports first trickled in of a mystical creature known to sprinkle “ZinDust” upon the vines of the Sierra Foothills. Over 150 years later, his work can still be experienced in a bottle of Zinman, one just has to close their eyes and enjoy all of the magical flavors that dance upon your palate. ZINMAN is one of Perry Creek’s most recognized and highly successful signature series wines. It is rated among the top 15 best-value Zinfandels by Wine Spectator in 2010 and its popularity continues to grow year by year. What makes it so special is the unique combination of spice and elegance in its flavors which stems from being produced in one of the best vineyards in the El Dorado County AVA. Its truly modern composition and sustainable farming practices makes it a must have for anyone’s dinner table. Perry Creek Winery 2009 El Dorado Chardonnay - This is a crisp Chardonnay with just a hint of vanilla and tropical fruit flavors. Food Pairing Suggestions include: stuffed, roasted chicken with tarragon, smoked turkey (yes I'm sure much like me, many of you are 'Turkey'ed' out by now!) , crab cakes with cream sauce, light curry dishes and summer salads. 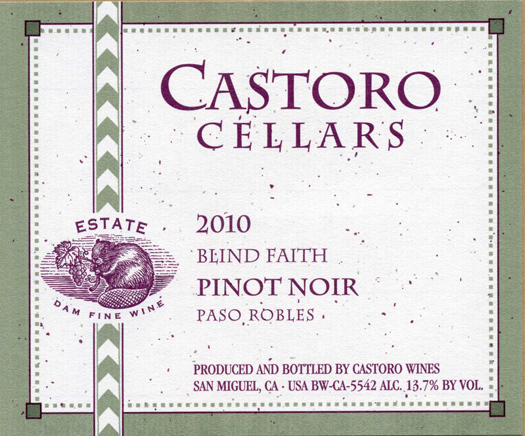 Castoro Cellars 2010 "Blind Faith" Paso Robles Pinot Noir - Grown in the Blind Faith Vineyard on steep terraces and dry creek bottom soils. These extreme growing conditions produce a unique wine with intense flavor. The 'Estate Lots' are watched carefully and only bottled in limited quantities when the wine warrants it. This wine is certainly a worthy addition to any wine cellar. It can be enjoyed now or held up to five years. Food Pairing Suggestions: Lighter meats like poultry as well as pork chops, ham, and my personal favorite grilled salmon. 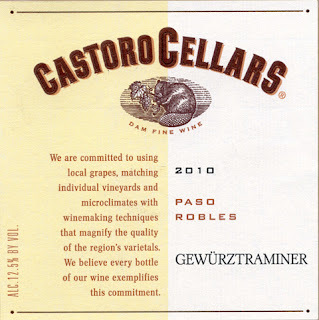 Castoro Cellars 2010 Paso Robles Gewurztraminer - Castoro’s Gewürz is made in such small quantities that the winery has never submitted it for review or competitions. The final blend was 77% Gewürztraminer, 15% Viognier and 8% Muscat Canelli. Food Pairing Suggestions: Great with salads, Japanese or Thai cuisine. It's the aromas of jasmine and ginger and tropical fruit flavors that make it such a perfect compliment to Japanese or Thai, and I love both! 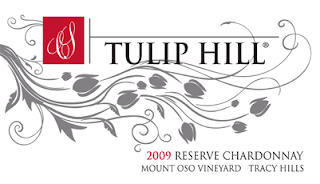 2009 Tulip Hill Winery Tracy Hills Reserve Chardonnay - Cellar Select Mount Oso - blended from 17 barrels of 100% MLF Chardonnay with tropical fruits and apples with a hint of spice. The undertones of butter and oak lend to a mouth feel that is rich and balanced leading to a creamy finish with a light punch of acid to extend the flavors across the palate. With notes of spice, black cherry, cedar, currant, vanilla and a delicious hint of dark chocolate, it's definitely elegant with a bright, juicy finish. It's a limited production making it perfect for a very special dinner or holiday party. I have nothing but good things to say about The California Wine Club, it's an amazing gift year round not just for the holidays. It's perfect for corporate gifts as well as personal, and the fact that they work directly with wineries in vineyards not just in Napa and Sonoma make the club a very distinctive and unique gift. I will say my preference has always been white wine over red, but through the club I've opened up my palate more and have tried many reds I wouldn't have found so readily locally that I have greatly enjoyed. Ordering via the club makes wine much more approachable and the Uncorked newsletter makes it fun. The convenience of having the wines delivered right to your doorstep and dazzling family and friends with wines they are not going to find at their local spirit shops is priceless! I'm a mega foodie, and my motto is never cook with a wine you don't enjoy sipping, and I have incorporated the wines into many of my dishes (recipes to come). I'm also a member of The California Wine Club's over 82,000 and counting fan base on Facebook, and I love reading their updates, there is always humor, fun tips and promos! Ƹ̵̡Ӝ̵̨̄Ʒ - WIN IT! - Ascending Butterfly and our friends at The California Wine Club would like to give 1 lucky winner a 3 month Premier Club Membership of their own! With Premier Club you get to choose, 1 red and 1 white, 2 reds or 2 whites, the choice is yours! Don't you just ♥ The California Wine Club? I know I do! Ƹ̵̡Ӝ̵̨̄Ʒ - Order any wine club as a gift or for yourself and post your order confirmation number or email it to me and get 10 extra entries! Ƹ̵̡Ӝ̵̨̄Ʒ - In honor of all things wine, tell me your all time favorite wine? Was it a winery you discovered during your travels? A house wine at your favorite restaurant? Ƹ̵̡Ӝ̵̨̄Ʒ - Like The California Wine Club on Facebook HERE (Tell them which wine club is your favorite and/or that you are trying to win a Premier Club 3 month membership from Ascending Butterfly) - Be sure you leave the link to your comment here for extra credit. (You can get the link the same way you do on twitter, press on the time you left the comment on their facebook wall, and when the page fully loads, highlight and copy the URL address and then paste it into the comment field here). If you say "I wrote on their wall" and do not leave the link that Extra Credit Entry will NOT be processed. Ƹ̵̡Ӝ̵̨̄Ʒ - Join Ascending Butterfly's Blog Frog Community HERE <-There is an active giveaways thread there too, so if you are a blogger also, please feel free to add your active giveaways to that thread! FTC Disclosure Info for this Giveaway: This is NOT a sponsored promotion. NO compensation has been received from the sponsor in exchange for this post. A 3 month membership was provided to me free of charge for editorial consideration. Also, The sponsors are fulfilling directly to prize winner(s), this in no way influenced my opinion of the products. All opinions expressed in this review are 100% my own. Once a winner is selected and their information has been forwarded to the sponsor, the responsibility of prize fulfillment rests with the sponsor. An Affiliate Link is used for the ScoreBig Extra Credit Entry and for EZ Win game. Subscriber! The International Selections club looks intriguing! I follow your blog publicly via Google Friend Connect as shala_darkstone. I like the International Selections series. I follow on gfc as degood and I like the Signature Series Wine Club. I don't have a wine cellar at my house and I feel I dont' ahve the ability to store the higher priced wines properly. My favorite wine is a merlot from a Woodinville WA winery called Brian Carter Cellars which is about two miles from my house. I follow CAwineclub on twitter as kmayans. I think the international collection sounds incredible! I think I would choose International Selections I love the thought of wines from around the world from small vineyards. I love trying wine from small places. Ooh, I'd definately want to try the international selections! i am a gfc follower. i like the signature series! I follow you on GFC as Happysoul12, and I would love the Signature Series! I follow Tracy Iglesias on twitter as @Jtooth12. My fave Wine Club is the International Selections because there are so many countries producing quality wines these days! I like the idea of sampling wines from Chile, Australia and Italy just to name a few. My husband and I enjoy fine wine and this would be a wonderful way to introduce ourselves to varies from abroad. My all time fave wine was one that we sampled during a wine tour in Temecula, Calif. 2007 Sauvignon Blanc from the Wilson Winery which won an award for them. I will always remember that tour. We were delighted with the whole day experience. I follow on GFC under BigJac, I like the International Selections. . . Yummy! I've been a Moscato fan for years, my favorite is Bartenura at the moment. . . or maybe Marco Negri. It's all so delicious!!! I love the Signature Series offerings. It sounds like it would be so much fun to try. Or the International Selections. Getting to try wines from around the world every month might be really nice. So far I don't have a favorite wine but I love everything I have had from Tobin James. I've tried many things from them and absolutely love them all. I'm a GFC follower :) The Upper Level Club sounds good. I am a gfc follower. I like the international club. I actually found a local mulled red wine, that is called witches brew that is now my favorite. I would choose the Aged Cabernet Series Wine of the Month Club. I discovered my favorite wines, Clos du Bois Merlot, while spending a weekend at Bally's Hotel & Casino in Atlantic City, NJ. I follow both your accounts on Twitter. My acct is Bellagigi711. I am a fan (liked) both pages, Ascending Butterfly and The California Wine Club. I think the international selections would be really cool! - My email address is in my profile - "frugal in ohio"
My favorite wine is a zinfandel wine - I had it the first time when I was out with friends at a local restaurant! also my email is in my profile! Fave winery would have to be Robert Renzoni. It's only a few minutes drive away, and they have some great Zinfandel and Sangiovese. tell me your all time favorite wine? My favorite wine is Chateau Morrisette's "Our Dog Blue"...it is from a vineyard in Virginia. A friend gave me a bottle as a going away present...little did I know I would eventually move to Virginia. I love all their wines! I follow cawineclub on twitter. (vadebby1). I follow your blog. My favorite wine club is the Aged Cabernet Series. I don't have an all time favorite wine. I follow @cawineclub on Twitter under the username likwan. I tweeted about this giveaway on Twitter at https://twitter.com/#!/likwan/status/147374292823322625. 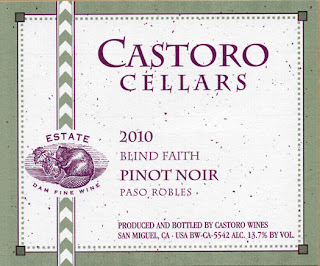 I follow The California Wine Club on Facebook and let them know about this giveaway at http://www.facebook.com/cawineclub/posts/330450890299179.